Like humans, cities and neighborhoods have their own unique fingerprints. While genes determine ours, a city’s mark is characterized by the relationship between buildings and open spaces. Think of it as “spatial DNA,” which is typically mapped out by urban designers and researchers in black-and-white diagrams. Black shapes indicate buildings and white represent the open ground. 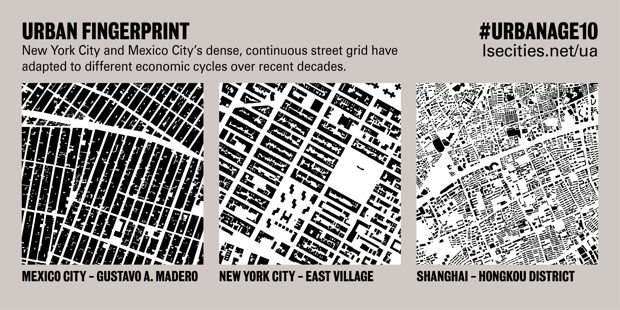 “These are useful tools to [visualize] the micro-scale of urban [neighborhoods] and understand how buildings and their surroundings succeed or fail in making a continuous and integrated urban whole,” Peter Griffiths, editorial officer of the Cities Research Center at London School of Economics and Political Science, says in an email. 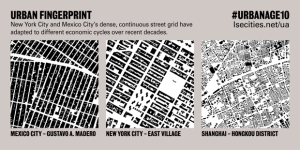 The maps were created by researchers at the center’s Urban Age program, who have been studying how the layout of rapidly urbanizing cities can affect their livability. Researchers used satellite photography and official city data to create the maps.